I got the Vintage Valentine chunky book this week, just one month late (we were promised to get them on Valentine’s Day last month). I don’t mind that it was late though, since I live in Sweden I was expecting it to be come late. And now it has arrived! I’ve never seen or held something as strange and cool as this art project, the first chunky book project I’ve been involved in. It is very chunky and fat, as chunky fat books should be I guess. Full of embelishments (hearts, beads, lace and threads!) and 39 very nice pages. I’m glad I joined this project, so that I can say that I know what the fuss is all about. I don’t think I will sign up to make 40 pages again soon though. Lots of work! 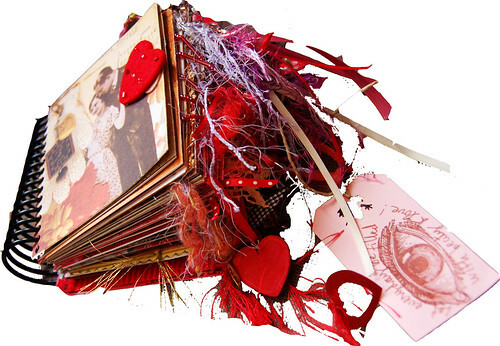 This entry was posted in Mail bliss and tagged chunky book, swapping, valentine. Bookmark the permalink. I love it! what a great project and what a talented group. A great project, I wish I were half as creative!!!! Welcome back! We have to chip in and buy you a laptop so you can write when you go on hiatus! Really cool and so beautiful Hanna! Det var verkligen l?nt m?dan att serietillverka 40 sidor! Tr?s beau :) I’ve made a group in flickr yesterday I’m inviting people to go there and maybe in the next months we will be doing some swaps, or journals or whatever, if you want you can join, your more than welcome. Hi Hanna: I just wanted to tell you that I loved your page in the VV fatbook. Very nice indeed. I agree with you, though, I am not hooked on doing them either. I would rather be working on more one-on-one, or one-to-none art projects. These swaps are a lot of work! A couple of times a year would be more than enough.